Why don’t you serve alcohol at the event? We have minors at the event and don’t want to deal with the liability. By law, we would have to close at 2am… Well, that’s no fun. By law, we would need even more security and ID checkers to staff. FYI, The Baxter Arena is right across the street from Aksarben! It’s walking distance to great eats, bars and many great hang out locations. It’s always been our policy to not allow alcohol but that doesn’t mean you can’t head over to Dudley’s and grab a pint while enjoying a slice of their amazing za. How can I carry my gear into the venue easier? We recommend using your rolling desk chair (if bringing one) to haul your gear. Or, ideally, bring a portable cart with you. 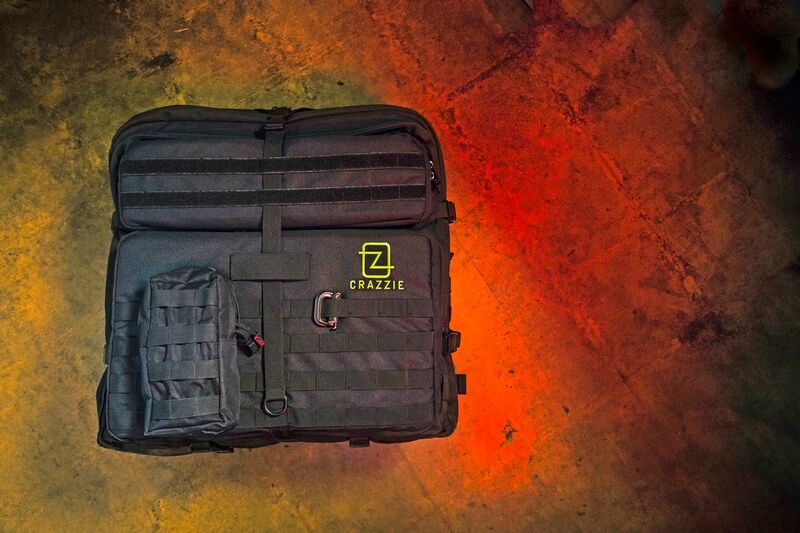 Read our blog post about LAN essentials for a backpack and cart we recommend. The best solution is a LAN backpack to carry all your gear. Why don’t you have X game for a tournament? A few weeks after we open registration for the event, we send out a tournament voting survey to all paid attendees. From this survey we gather what are the most popular games and for what games our attendees want us to host a tournament. We pick the top four most requested games to host a tournament for. Sometimes our ability to host a server depends on (and can be prevented by) our ability to obtain private servers or other restrictions from the developers. We understand that there are a lot of popular games out there, but we can’t possibility run a tournament for them all. We have to limit to four tournament games due to the length of the event. We have tried doing more in the past, but always run into time issues. We also can’t run them in parallel due to attendees wanting to play in more than one, as well as the confusion when we make announcements and organize the tournament. Can I sleep at the event? Where? Yes, bring a sleeping bag and pillow, or even a tent. The sleeping area is located on the second level concourse on the far sides of the concession stand. If you wish to sleep comfortably, there are a few hotels within a few minutes of walking, see event location details. Or you could crash at friend’s or relative’s place. Make sure to read our FAQs on the Event Details page where we answer a lot of the questions we receive. RED (NETWAR Admin) was super overly excited for the new venue. He has since calmed down and won’t rave as hard for NETWAR 36.0. It will be better for NETWAR 36.0. We were working through it even before 35.0 was over. We have had numerous conversation with the food vendor regarding feedback we received for them. They are working to improve for NETWAR 36.0. We are across the street from Aksarben. There are tons of options within walking distance. We would give a right arm for an unlimited supply of those funnel cake fries. The setup was amazing this year. I really like the greater space baxter allows, and the giant screen in the middle. The venue was absolutely epic, perfect, and setup as always was fantastic. Prizes were top notch, and bringing in NFM and the other vendors was great. I liked the quality and consistency – no hiccups ever. Parking was great, Space was novel, Network speeds seemed awesome. I loved the atmosphere and the setup. The location, sound quality over speakers, atmosphere, internet speeds. The new venue afforded a better layout with admins in the center, rather than crammed along the wall. Having security was nice also– but the highlight was, as always, the authentic LAN experience. I feel a LAN party should be a friendly gathering, and you guys always manage to nail it on a large scale. This was my 5th NetWar– and I love that it isn’t the mouthy “I’m only here to get paid” crowd that cash-prize e-sports events draw. Keep up the good work! I loved getting together with friends and playing along side them since I love 2 hours away. Also meeting new people and making new friendship was awesome . The mic system was great. I could actually understand you. Environmental effects like the lights were pretty cool. Set-up between tables felt wider and there were very few cords to trip over. Awesome announcements and Jumbotron, very smart staff. The venue was amazing. Best venue yet! I’ve been coming since Digz and this is my favorite. The temperature was a lot better too. It is the original “Social Networking” all in the same room… Loved it. I really loved the environment aspect. 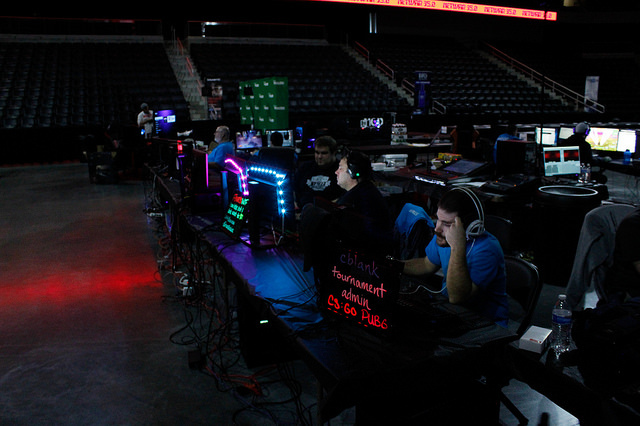 Felt like an esport stadium when we were competing at the arena.